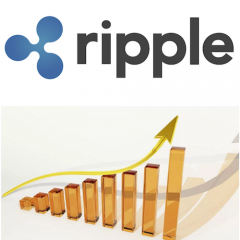 Ripple's XRP Lockup, Any Updates? Ripple is not selling banks via the market. As far as I know they are aiming not to drop the market with the supply of XRP they have left to be sold. So how do they sell the XRP to banks? In order not to drop te market and distribute more XRP, they sell XRP directly to banks and try to include this in a contract form/agreement with the banks/institutions. I assume ripple offers banks a little of price reduction in this sort of agreements, but banks are just allowed to sell a little bit of their stash at once(so the market does not get overflood). Why do altcoins (incl. XRP) correlate with BTC? It is all related to market forces. If I buy XRP via BTC it will be cheaper to buy XRP when the bitcoin price gets lower. Because of arbitrage people will start making use of the most rewarding trading options. For the direct market movements there is not always one holding solution. Especially with a lot of trading bots who primary all are focused on the same trigger they might influence the market as a primary factor. This is because of the fact that bitcoin is the standardized bridgecurrency for cryptocurrencies. The price of most cryptocurrencies is only expressed in bitcoin and therefore when bitcoin goes up the price of this currency indirectly also goes up. However, some cryptocurrencies also have other bridging pairs. But because of the fact that bitcoin is the market leader and most cryptocurrencies are expressed into bitcoin a decreasing bitcoin will make it more interesting to buy a currency via bitcoin(because it becomes cheaper). This is due to market forces. If I own 1 ether and by switching it for dollars and then switching dollars for bitcoin and bitcoin to ether to get 1.1 ether I will do so(because I get more value). Money goes where it can create value and since bitcoin is still the market leader cryptocurrency and bridgecurrency it has a big influence on the market. There is no way around it, until cryptospace grows more mature and more top cryptocurrencies get directly paried to fiat currencies. Why sell xrp to individuals? To start with, individuals can just use it the same as banks do. You can buy XRP and send it to somebody else with a ripple address without waiting for weeks before your transfer is received by the other party. Furthermore, besides of banks there are also big investors that like to have some XRP. I also think that it is not a matter of or, but banks and individuals can also participate both in a cryptocurrency network. However, when XRP grows as a currency(and having it a lot of pros above cons) in the future it can also become a great service to become a payment service. Just my personal opinion on it. Just delete this topic and eliminate this kind of links. This is not worth the risk in any way, since a lot of zepers can lose more than a few grands for 0.3 dollar. Please do not use, this can be a phishing mail registration form or something like that. Also it is not smart to give away your personal details, especially when you own cryptocurrencies this could hurt. I'm in for a few bucks. Looks like a good project in the long-run to me. I'm totally sober, but only slept 3 hours due to the fact I have been buying iota all night before listing lol. HODL HODL HODL HODL HODL. If we do that together we will be well off sooner and sooner. I choose to diversify a bit in the meanwhile in cryptos like siacoin, radium, iota, tokes(because the casino was closed). However, happy waiting. Live your life, make something out of it and be patient, like water my friend. Why like water, because it's the only thing that influences the world without doing anything itself, it just flows. It makes the world flat, waters the seeds, gives life and is able to kill. While it seems like it's doing nothing. But water is patient and will outrun everything in the world. How Would a Recession Affect XRP? A recession in the stock market doesn't necessarily mean that this will automatically reflect into cryptocurrencies. Whether it works out positive or negative for cryptospace is up to a lot of different circumstances. Any Sub 100 Million projects I should look into? You can use rippex desktop wallet or you can chose to restore them on gatehub for example. Remember that using a desktop wallet is usually more safe than an exchange. If you chose to use gatehub(or any other exhange), please activate two factor authentication. In order to restore your XRP you will need to put in your secret key in for instance the rippex desktop wallet, which will unlock a wallet with your initial funds in it. I hope you will do the best with it. It is possible, but not in the very near future. Expect these price levels to take at least 2-3 years. Sit it out and see where it gets you. Ask the employees for it when they are in the zerpbox, I'm pretty sure that they will admit that there are some ripple stocks in hands of old employees. You can buy them from old employees or people who own them if you find them willing to sell some to you. I think you don't really get it well. He means 23% ripple stocks and 77% xrp I guess. If what he says is correct indeed. I canceled the party, read my message before. There was no new announcement! You will know when there is! I don't really understand your question. But in general, when you do technical analysis you assume that all events happening are already priced in and based on the longterm growth you might see an uptrend and a downtrend. The fact that a coin might explode and not follow the analysis you make is not taken into account into an analysis if you ask me and is more the speculation/hype part of investing.